Barry has been released from prison and has gone back to his life, but Central City isn’t welcoming him back with open arms. The mayor has put pressure on the CCPD, and Director Singh, to not allow Barry to return to his job in the crime lab until the bad publicity from his trial has blown over. Singh will not directly fire Barry, but places him on an extended leave of absence. All the better to give him time to track down DeVoe. Ralph on the other hand is beginning to feel more than a little cooped up, he’s now on a “buddy system” where a member of Team Flash is with him at all times. While investigating the bus with Cisco, Ralph finds a CD by an aspiring country musician named Izzy Bowen. Ralph and Barry track Ms. Bowen down and discover that she has the ability to amplify sound into a weapon – this enables her to play her music effortlessly and use it as a weapon. Cisco gives her the name: The Fiddler, who is in no way interested in Barry and Ralph’s spiel so she uses her powers to distract them and escape. Barry and Ralph aren’t the only ones desperate to track down the remaining bus meta’s – Becky Sharpe’s body is depleting fast and DeVoe needs a new host body. Ralph and Barry are on hand in costume when DeVoe makes his move and are witness to Izzy using her powers to defeat DeVoe. Team Flash takes Izzy back to S.T.A.R. Labs in an attempt to bring her into the fold against DeVoe, and Ralph develops a bit of a crush on the lady. Meanwhile, Harry creates a device for Cecille that will allow her to cancel out her gestational mind reading while she sleeps. Harry realizes that this device could be used against DeVoe and pitches it to Team Flash, who all immediately recognize it as the device mentioned by Savitar that Team Flash created to stop DeVoe. Izzy gets frustrated with Team Flash and runs off to take her chances on her own, but she is almost instantly tracked down by DeVoe. Barry and Ralph show up and try their best to save Izzy, but the Neural Dampener built by Harry doesn’t work. DeVoe claims Izzy’s body as well, and Harry begins working on another device he can use to help Team Flash take down DeVoe. Ralph and Barry bond over the loss of Izzy. Reconceptualizing the classic Flash villain “The Fiddler” as a young, female, up and coming Country singer as opposed to the aging, male, classical violin virtuoso is a masterstroke that sets up a chance to give Ralph a reason to try to stretch beyond just being the sidekick hero to Barry. It’s really Ralph’s attempts to connect with Izzy, and his success in trying to prove to her that Team Flash has the best interests of the world at heart that locomotive ahead this narrative – and as of this moment furthers the notion that Ralph can actually be a character rather than a caricature. We’re also starting to see the cracks in the foundations of the DeVoe marriage, with Marlize having issues with Clifford’s actions as they spiral further and further from their intended plan. Watching Harry attempt to reach out to Cecile in an attempt to form a friendship outside of S.T.A.R. Labs is hilarious, and thankfully finally pays off the seeds laid by Abra Kadabra and Savitar in Season Three about defeating DeVoe. While I fully anticipate this will ultimately lead to DeVoe’s defeat, I suspect it will come at something of a price to Harry who has taken proving himself to be smarter than DeVoe to obsessive levels. Danielle Nicolet who exhibits the patience of a saint in scenes with the overactive child that is Harry Wells. There won’t be much to recap here, because this episode is very much about the way the characters react to the situation than about the progression of the plot itself. Jesse Quick has hopped over to Earth -1 to visit her Dad, and is on site with Barry when a nuclear bomb goes off in Central City. Barry immediately starts running at his top speed, slowing down time around him to try to find a solution. Jesse can move alongside him – but both speedsters are new to the concept of going this fast. Barry sends Jess to Earth 3 to illicit the help of Jay Garrick, while Barry speeds up other members of Team Flash to superspeed (just as he did to Iris in the courtroom when she was going to admit his identity) to try to formulate a plan to dispose of the exploding device. Cisco cannot breach it out of Central City because he’s moving too fast; Caitlin can’t freeze it for the same reason. Harry suggests letting the bomb go into the Speed Force so that it explodes there instead of in Central City. Jesse returns with Jay Garrick, who immediately suggests that Harry’s plan is stupid and that they should in no way attempt it as it might take all of their powers away forever. Eventually Jay gets to a point where he can’t keep up and he slows down to the speed everyone else is frozen at. Barry urges Jesse to return to Earth 2 before it’s too late, she instead goes to see her Dad one last time before she too falls to normal speed and freeze. Barry pulls Iris into Flashtime and she helps Barry realize that he doesn’t need to put the bomb into the Speed Force, but he can use the Speed Force storm to destroy the bomb. Way back in episode one, to allow Barry to escape the Speed Force prison Team Flash launched a probe with Barry’s DNA into the Speed Force to convince the Speed Force that he was in there even when he wasn’t. Barry races into the Speed Force, retrieving that ball of his own DNA so that when he leaves the Speed Force the Speed Force storm resumes – and he makes sure that the lightning from the storm is aimed directly at the nuke. The speed force energy prevents the nuclear blast and renders the bomb inert, Barry returns his DNA into the Speed Force and everyone returns to normal. This is definitely in contention for best episode of The Flash thus far. Often Flash is a show of big events that never quite fully live up to the potential of a show about a man who can move at speeds that you and I simply cannot comprehend. It’s long been the complaint about Barry’s (and Wally’s for us comic fans) power set that he’s simply too overpowered – and the comics capitalize on that power in inventive ways that create challenging stories for The Flash that require unique applications of his speed. Often, the series – by virtue of an effects budget and the need for more grounded storytelling – sticks to the tried and true: Barry races against time to stop the problem while Team Flash solves anything that doesn’t involve speed through the application of cool tech developed by Cisco and Harry. It’s a formula that works well for the show, but it can lack the inventiveness shown in the comics. Enter Flashtime challenges that head on by creating an entire episode spent moving at Barry’s top speed – with the brilliant touch that the other speedsters who join in to help stop the explosion aren’t able to hold out as long as Barry. Effectively a bottle episode hanging on three actors and two primary sets is created in such a way that it conveys a level of Barry’s powers that we’ve not yet seen. The other brilliant part of this construction of this episode is that it hangs an entire episode on the strength of Grant Gustin; with so many characters on The Flash, Barry oftentimes is overshadowed by the likes of Cisco or Harry. It’s nice to scale back and let the star of the show shine on his own once more. As great as it is to have both Jesse Quick and Jay Garrick along for the ride protecting Central City, it highlights the absence of Wally West. Obviously the character had already shuffled on over to Legends of Tomorrow, but it is a damn shame that this show has a better handle on how to use Jesse and Jay as supporting speedsters than it has on how to include Kid Flash. Carlos Valdes as Cisco Ramon stands frozen in place better than any of the other actors this week. I’m just kidding. This week it’s all Grant Gustin as a Barry Allen pushed to the very limits of his abilities to save his friends. Team Flash has a bit of a groove going; Harry is building his own thinking cap, Iris is calling the shots in S.T.A.R. Labs and things are going okay. Still, Ralph isn’t so sure about Iris as a leader – and he begins to question why she is making the calls when she doesn’t have any real skin in the game. As a result of that, Iris agrees to go into the field with Barry to investigate a mysterious bank robbery where a metahuman lost his powers. It turns out that during the robbery an EMT named Matthew Kim – a Bus Meta –used his abilities to remove the criminals powers. 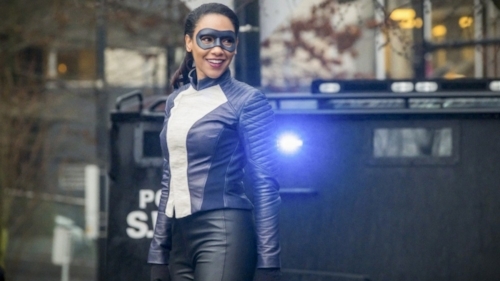 Kim has the powers to transfer metahuman abilities from one person to another, and when he fears that Team Flash is coming to get him – he gives The Flash’s powers to Iris and escapes. The team has to figure out how to give Barry his powers back, and Iris takes on her role as The Flash in his absence, even helping to stop a large building fire and save hundreds of people – just like Barry would. A classic meta named Melting Pot creates a thermal cyclone and there isn’t a whole lot of time to figure out how to stop it; Harry uses his new Thinking Cap to figure out that Iris needs to create a tidal wave to take the cyclone out – but she’s afraid she can’t do it. Barry talks her through it, she runs back and forth until she creates enough force to take out the cyclone and brings Melting Pot in. The team tracks down Matthew Kim and recruits him to 1. Give Barry his powers back and 2. Join them in trying to take down DeVoe. Ralph accepts Iris’ leadership, but Iris realizes something is missing from her life – so she reopens her long dormant blog and takes a step toward becoming a reporter again. Harry uses his Thinking Cap and comes up with the names of the last two bus metas that Devoe is searching for. The standard “powerless character gains power/powerful character loses power” trope can easily slide into parody, but thankfully that wasn’t the case with Iris gaining Barry’s powers and Barry suddenly having to join the support staff. Obviously there is some inherent comedy with usually confident and hard charging Barry having to stay at STAR Labs and use a computer, and that is mined quickly before pushing forward into what is the central theme of the episode: exploring Iris’ role as a leader, a hero, and a team member. This season has introduced us to a different version of Iris West, one who picked up the pieces after Barry’s disappearance into the Speed Force and took over leadership of the new Team Flash that was built around Wally West. As the season has progressed Iris has continued to lead the team, but at the cost of her own individuality. This episode is used as a lens to remind Iris that she has value to contribute outside of Team Flash, whilst also showing Ralph that he can trust in her leadership and her decisions. Introducing a Bus Meta beyond Ralph who finally gets saved by Team Flash was a much needed win for the team at the point where they’ve had so very few. Candace Patton steps beyond her usual level of performance and gives us an introspection that was well earned and well portrayed.